Revised for September 2017: 88 exciting PowerPoint Presentations for Key Stage 2 Mathematics. Designed for use by teachers to make explanations of topics clear to pupils. 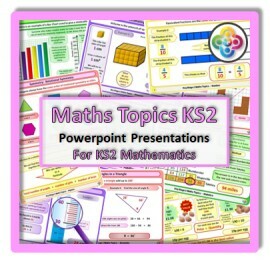 Maths Topics KS2 is a one off purchase for lifetime use in your school (No recurring fees). Presentations cover topics in the Current KS2 National Curriculum. You may copy the files onto school networks to which staff have access so that they can use the presentations in their lessons. Staff may also put the files onto their own PC for use in lesson planning (although these must be removed should that member of staff leave the school). The files may not be placed on any network to which there is general public access, and they must not be loaned or passed to other schools or organisations.